Iota Localization Services - Is bigger always better when choosing a localization partner? Whether you’re an ambitious technology firm making your first move into a new international market, or a global giant reviewing your strategy, buyers of translation and localisation services often turn to the largest providers first. This is common in many sectors, not just localisation. What’s more, it’s sometimes understandable — the biggest providers are going to be the best, surely? Well, maybe. Perhaps if you’re buying paperclips or envelopes. But if you’re buying complex services, where flexibility, trust, and good old-fashioned customer service matters? Not so much. We find that our clients, regardless of their size or profile, value flexibility and service over a 2% cost-saving every time. They often come to us from the largest language service providers (LSPs), complaining of being forced into rigid processes that don’t suit them and only being able to speak to faceless ‘account handlers’ who have no real appreciation of the nuances of your localisation strategy. Iota also work with several early and mid-stage technology companies. In many cases these firms will have received VC funding and be committed to expanding internationally in the short to medium term. Working successfully with companies at this stage requires a unique combination of unwavering reliability, localisation expertise, and the flexibility to respond quickly to the demands of a rapidly-scaling organisation. Very few of these requirements will be successfully met by a monolithic LSP who assigns their client ‘bronze status’ when they spend less than $1 million a year on localisation. Surely that’s the wrong way around. 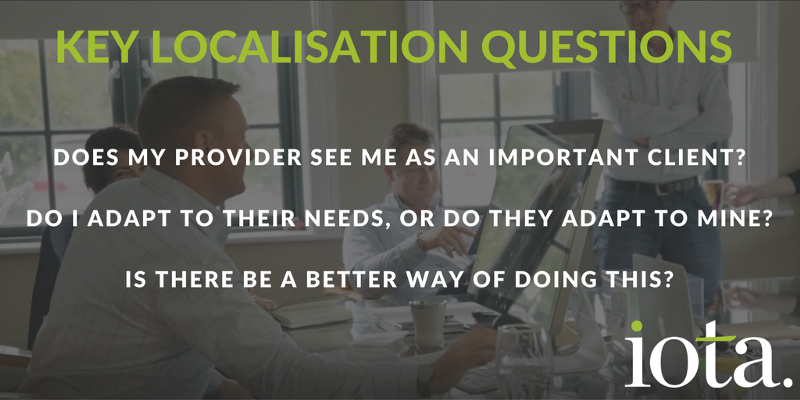 As a client, wouldn’t you be looking for a localisation partner to provide a solution that solves your problem, not one that simply suits them? Maybe it’s just us. Maybe we are the odd ones, crafting bespoke solutions to meet the unique challenges our clients face. Developing bespoke tools for individual clients that reduce costs and time-to-market. Hand-picking linguist resources that best match the objectives of the project. Does my localisation provider consider me to be an important client? Iota would probably be defined as a ‘small’ localisation provider in terms of employee numbers, global offices, and the usual metrics used to define these things. Despite this, we boast a place in Common Sense Advisory’s Top 100 LSP rankings and have worked for over a decade with some of the largest, most recognisable and respected technology companies in the world. If you want to speak to any of them to see if they regret not working with a ‘large’ LSP, let us know and we’ll put you in touch.